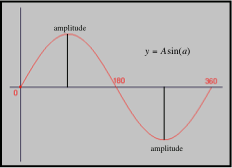 As shown in the following diagram, the amplitude is the maximum and minimum values for y when graphing the equation y =Asin(a). Change A, and the heights (amplitudes) change. This project can be viewed at http://scratch.mit.edu/projects/popswilson/2971107 on the Scratch web site. from popswilson’s My Stuff page. Below is a screen shot of the project. After the first sine curve (in blue) with an amplitude of 100 is drawn, set the frequency to another value and press the space bar to plot the new curve in the color red. 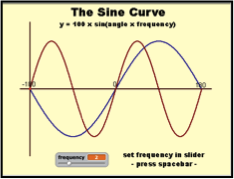 The red curve in the screen shot is the plot of the sine curve with a frequency of two. The FM after the call numbers of a radio station refers to frequency modulation. The signal (an electromagnetic wave) that carries the radio broadcast from an AM station is modulated (changed) by varying the amplitude of the wave. Varying the frequency of the wave modulates an FM radio signal.